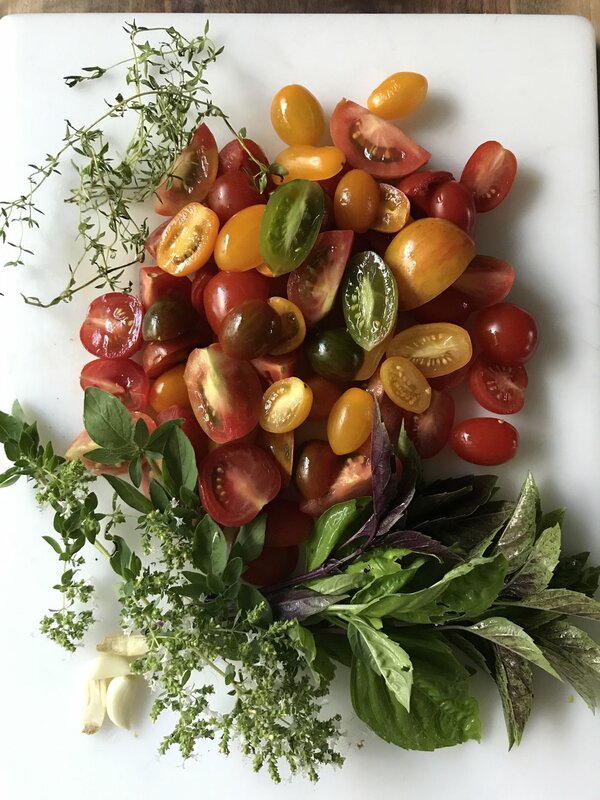 This is one of those salads that eats like a meal and is great for any season, but is particularly good in the summer when tomatoes are at their peak. Feel free to use any fresh herbs you have available, here I used basil and oregano, but thyme, chives, fennel would be just as delicious. In a large skillet, heat oil over medium heat. Add anchovies and cook, breaking them up with a wooden spoon, until they dissolve. Add chopped garlic and onion and stir for a minute until fragrant, but not browned. Add smoked paprika, give it another stir, then add shrimp and cook them for about 3 - 4 minutes (depending on the size of the shrimp), or until just cooked through. When shrimp are ready, stir in tomatoes and olives to just warm them up. Remove from heat and taste for seasoning - you may not need much salt, if any, because of the saltiness of anchovies and olives. Squeeze juice from half a large lemon over the whole thing and give it a gentle stir. Place washed, dried greens onto a large platter, dress with a squeeze of lemon and sprinkling of salt, toss gently. Top the greens with warm shrimp mixture, fresh herbs and serve straight away with some lemon wedges on the side.